Bradwell site hosts one of British science’s pioneering Magnox nuclear reactor designs from the 1950s. Eleven of these power stations delivered electricity into homes and businesses across the UK, safely keeping the lights on for many decades and paving the way for the subsequent reactor designs that still operate today. It is 15 years since Bradwell, on the Essex coast, stopped generating electricity. The defueling process – removing tens of thousands of spent fuel elements - was completed just over 10 years ago. Defueling removes 99% of the radiological hazard. 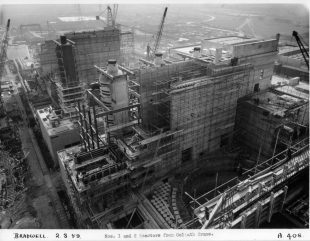 Since then, Magnox teams at Bradwell site have worked to drain and clear its fuel cooling ponds, as well as transfer radioactive waste to modern stores. All this work will culminate in 2019 with the reactors and waste stores being sealed (becoming “safestores”), and then the site will be kept in a passively safe and secure state for a great number of years. Eventually, these remaining structures will also be cleared. This “care and maintenance” period will allow radiation levels to naturally decay over time. This will result in simpler and more cost-effective decommissioning at final site clearance, currently scheduled to start in 2083. Preparing for the “care and maintenance” period often means building structures as well as demolishing them. As part of this work, we completed our biggest construction project in 2016: the cladding of both reactor buildings with protective weather-proofing. 900 individual people worked more than 980,000 hours over 4 years to achieve this. Looking at the reactors now, it’s clear how the site will look during its care and maintenance phase. We are now focusing on processing the remaining waste and putting into place the infrastructure to provide safe and secure care and maintenance phase. These works are intended to complete by 2019. Our teams have made huge steps forward in safely dealing with the hazards at Bradwell. Reaching the “care and maintenance” phase will represent a significant reduction in the radiological risk we are managing. 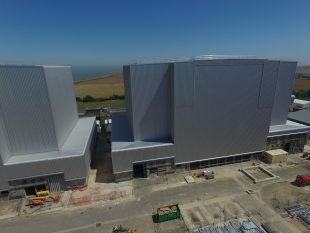 Ten other UK Magnox reactor sites will benefit from the lessons we learn as we prepare for this phase of Bradwell’s life. We would like to hear your views on our work to decommission 17 nuclear sites across the UK. Could you have the solution to the challenges in nuclear decommissioning?